Once again, I’m not sure why I can’t seem to find the time to make an update. But, I’ve mostly seen Pennsylvania games the last five weeks, including three this past weekend when I decided a 340-mile round trip to New Philadelphia from where I am this weekend would be just a tad too much for the Big Red game. In PIAA District 10, there were three games to see this weekend. On Friday night, I was at Slippery Rock University’s Mihalik-Thompson Stadium for Cochranton and Sharpsville in a 1A Quarterfinal matchup. I’ve seen both teams play in the past two years. Cochranton had hosted Iroquois on a rare Thursday night game in which they had lost. And Sharpsville last year had won the District 10 title in a matchup with West Middlesex at Hickory High School. Sharpsville came in as the easy favorites and Cochranton was making their first playoff appearance since 2003. Coincidentally enough, Cochranton had pulled the upset that year over Sharpsville in the first round. Cochranton had new uniforms that looked like Dover with a Princeton-style grey helmet with red decal. Sharpsville, on the other wore all blue with a white helmet featuring a blue Princeton-style decal. This game was over quickly. Three offensive plays for Sharpsville netted two touchdowns. A 48-6 final ended the season for the Cochranton Cardinals. Meanwhile, a few miles away at Wilmington HS, West Middlesex, the other behemoth in D-10 1A football, raced out to a 63-0 halftime lead over an overmatched Iroquois team. The Big Reds had taken their foot off the gas, but still coasted to two more mercy rule limited second half touchdowns to win 75-13. Iroqouis came into the game with a 3-7 record. Now, to explain exactly how PIAA playoffs work. The state playoffs do not begin for another three weeks. Officially, these are the District playoffs. And the PIAA has 12 districts (and District 12 is split in two, with the Philadelphia Public League and Philadelphia Catholic League operating independently until their two champions in their various classifications play eachother). Now, not every district has a team in all four classifications. Or, not enough for automatic qualification. Because of this, the PIAA has subregionals. For instance, District 10 has 1 4A school: McDowell. District 9 has one 4A team, DuBois. So, there’s a subregional where McDowell will qualify for the playoffs EVERY YEAR regardless of record and have a playoff game against DuBois. This presents itself in District 8 (Pittsburgh Public League) where Westinghouse (the team Buckeye Local, Steubenville, and Wheeling Central all crushed) is the only 2A team in the city and therefore qualify for the subregional by default. Despite a 2-7 record. But, ever District gets to decide their own playoff structure. Some do neutral site, some do homefield. Some do conference standings, some do a rating system. Some do crossovers, etc. District 10 switched from member conferences to district-appointed regions. 1A and 2A have two regions (Region 1 and 2 in 1A, and 3 and 4 in 2A). And due to only one 4A school, they ‘bring in’a few non-District big schools to help fill the schedule and play Region 5 and 6 with mostly 3A and a few 4A schools. Non-district teams still must go to their own district once the playoffs start. But, back to District 10. In 1A and 2A, the top four teams qualify for the playoffs in each region for eight overall. Your regional record is the only deciding factor on qualification. Earlier this year, Greenville had beat archrival Reynolds in 2A (I attended it), and clinched a playoff spot despite a 4-5 overall record. Meanwhile Reynolds had the better record, but finished with the same conference record (at best) and had lost the head-to-head tie-breaker. So, Iroquois got in with a 3-7 record. Elsewhere in 1A, Lakeview beat Eisenhower and Farrell beat Mercyhust Prep. So, all four Region 1 teams won over Region 2 teams. And, they all represented Mercer County. Sharpsville and Farrell are Sharon suburbs and West Middlesex is just a few miles south. Lakeview is the only outlier, from the eastern edge of the county in Stoneboro. Then, on Saturday at 1pm and 7pm, were the 2A games. At 1pm Greenville played Corry at General McLane HS in Edinboro and Wilmington played Fairview at Grove City HS. I took my father to the Greenville-Corry game. My dad is disabled and in a wheel chair and doesn’t get out much. I take him to Browns home games, but with this being their off week and next week being a road game, I asked him if he wanted to go with me to see the Greenville playoff game. Which is why I decided to forgo a breakneck race to New Philadelphia in time for the Big Red game. It was his first HS game since he was in high school. His school, Badger, never had football, but he did attend a Pymatuning Valley game in Andover when his friend played. So, suffice it to say I was hoping for a good one. The Greenville Trojans came into the game with a 5-5 record and were the fourth seed out of Region 3. The Corry Beavers, on the other hand, were 8-2 overall and came in as the Region 4 champions. Greenville’s primary colors are blue and yellow and their road attire were blue helmets, white jerseys, blue numbers, and yellow pants with two blue stripes. Grey facemasks with a yellow/white Trojan head logo on the helmet. Corry wore all black with an orange helmet and white jersey numbers. General McLane’s Linden Field is nice for a high school stadium but doesn’t aspire to have any atmosphere. A track surrounds the turf field with a red GM at the 5 and the endzones have McLANE and LANCERS in the two endzones. As with all District 10 playoffs, the tickets are all $5. Now, Corry was the decided favorite. And in the first quarter, darted out to a 14-0 lead with a slew of Greenville fumbles, including a costly non-fumble that was called a fumble long after the player was down but no whistle was being blown. Aside from that, Greenville steadied themselves and kept the game within two scores late into the second quarter. That’s when it got interesting. Greenville scored on an 43-yard hook-and-lateral with 22 seconds to make it 14-7. A surprise onside was followed by a Corry penalty and then 18-yard option lateral to tie it at 14-14 with 8 seconds left. A huge momentum shift. A score midway through the third made it 21-14, but Corry came right back to tie it at 21. A good drive and a 2 yard touchdown run with 24 seconds left in the third made it 28-21, Greenville. But, again, Corry rallied to tie it at 28 just three minutes later in the fourth. Greenville mounted a strong drive to take it down the field for another touchdown with 4 minutes left to make it 35-28. Corry was driving and with two minutes left, Greenville forced a fumble and recovered. One first down later and with no timeouts to stop them, Greenville ran out the clock for their first playoff victory since 2003. Very fun and entertaining game. And, coincidentally, the closest of the 1A and 2A games this weekend. I drove my father the hour home and returned to Edinboro. Given his issues, he’s not one to be out late or for long. So, I was back in Edinboro and this time was in town heading to Edinboro University’s Sox Harrison Stadium for another 2A matchup between Hickory and Northwestern. Now, in Region 3, Hickory, Wilmington, and Grove City were in a three-way tie for first with Greenville a distant fourth. All four of these teams (the three Region 3 teams and Northwestern) had already beaten Greenville earlier this year. And, Hickory may be one of the best ‘one man show’ teams I’ve seen in a while. #7 Deshawn Coleman is already committed to WVU and just an amazing running back to watch. It’s like everyone else is at half speed when he has the ball. Hickory returned the opening kickoff for a touchdown and then scored on the first play of their first possession. And then on the second play of their second possession. The first quarter ended with the Hickory Hornets of Hermitage up 21-7. Three more touchdowns in the second quarter made it 41-7. Included in it is one punt returns where Coleman made what seemed like the whole Wildcats team miss at least once. The highlights can be found at myvalleysports.com if you look for the Hickory-Northwestern game. In the end, Northwestern was no match and this game was over from the first play. Hickory cruised easily to a 48-22 victory. Elsewhere, Wilmington beat Fairview 47-0 and Grove City beat North East 56-14. Fairview was a school Steubenville played a few years ago in a one-off contest. From the west side of Erie near Girard, PA. Just north of Albion, where Northwestern hails from. Again, for the second straight day, Mercer County ruled. All four Region 3 schools won, and all four are from Mercer County. Due to scheduling at facilities that are both neutral and having turf, makes this upcoming schedule intriguing. The Friday games are for 1A, 3A, and the 4A subregional between Erie McDowell and Pittsburgh Perry at Fairview HS. Saturday will host the two 2A games. The 3A semifinals will take place at Slippery Rock University (Slippery Rock vs. General McLane) and Erie Veterans Memorial Stadium (Erie Cathedral Prep vs. Warren). The 1A games will both be played in Mercer County. West Middlesex will play Farrell at Wilmington HS and Lakeview will play Sharpsville at Grove City HS. And Saturday will be a doubleheader at Mihalik-Thompson Stadium at Slippery Rock University. At 1PM, Grove City plays Hickory and then at 7PM, Greenville plays Wilmington. Now, for the year up-to-date. As of this week, I’m up to 66 total high school games this year. Only 7 short of last year with still 5 more weeks (Pennsylvania goes to what would be Ohio Week 17). So far this week, my Thursday games have been some of the more interesting and memorable if not simply because of their stature as the only, or simply only accessible, game that day. The last three Thursdays this year were two Ohio games and the one PA game. I’m not sure why Mathews had a home game on a Thursday, but it was fun. They have a really old, decaying stadium that actually alarms you when you walk on it as you can feel the wooden cross members sway. Alas, it was not Mathews night for a win. In Week 9, I got to see Aliquippa’s famed “Pit”, a stadium that feels like Harding stadium if no upkeep was done on it for fifty years and was about half the capacity. No track, and really tight to the field with steep, great angles. Built on a hill behind the school. The visitor stands have the walkway closed below the stands, I assume, due to risk of injury from the crumbling concrete structure. Grass field turning to mud as it rained. And, in Week 10, was a trip to Midvale between Uhrichsville and Dover to see this matchup. Indian Valley pulled away and won convincingly. Fun atmosphere. Apparently scheduled on Thursday to not conflict with the Dover-New Philadelphia game. My regular Friday game has been the Steubenville game with one exception. In opted for Greenville-Reynolds in Week 9 rather than witness a Canadian team be led to slaughter. Greenville trailed, but scored late to tie it and send it to OT. Reynolds then scored to make it 26-20 and missed the two-point try. Greenville then scored and nailed the extra point to knock Reynolds out of playoff contention and secure Greenville their playoff berth. 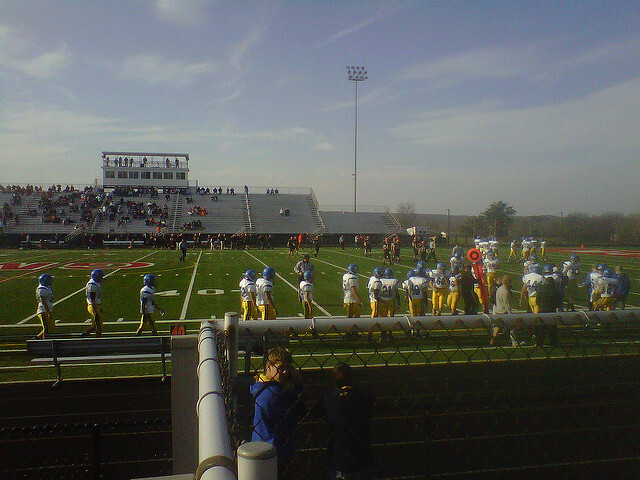 I also drove out to Richmond, Ohio three times after the Steubenville game ended to watch the Edison game end. Once they beat Weir and twice those lost, to Harrison Central and St. Clairsville. Also, after the Massillon game, I drove over to Perry to catch the last quarter of their scoring bonanza with North Canton Hoover. The first two weeks of the season were four games in Kentucky in Week 0, and ten games around Cincinnati and the two OVAC Kickoff games at Steubenville on the Thursday. And lastly, are the Saturday games. Regular games, I saw two games at Bellaire St. John Central (vs. Conotton Valley and vs. Toronto). 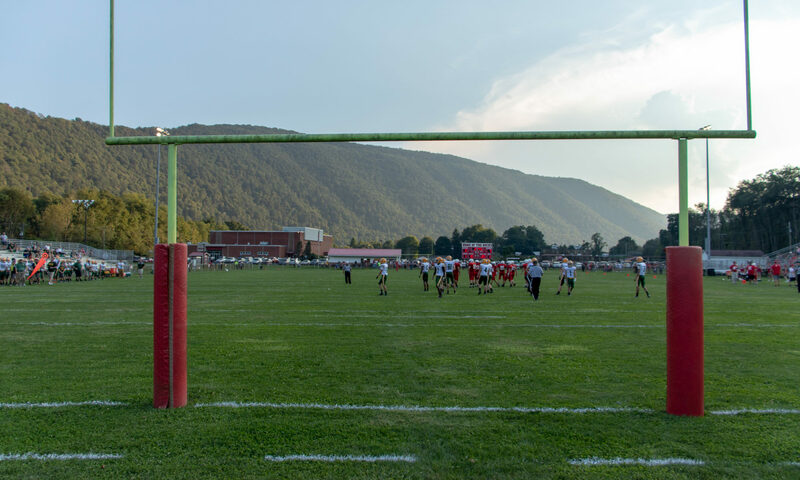 Once the Conotton Valley game was over I drove to Bellaire’s field to catch the end of their game with John Marshall. And the other I went over to Wheeling to catch the second half of Linsly’s game with Bishop Ready. I’ve seen one game at Conotton Valley (vs. Strasburg-Franklin), and a few Catholic Central games (vs. Barnsville and vs. Conotton Valley). I did catch the last three quarters of the storm-delayed Wheeling Central-Weirton Madonna game. In PA, I saw Shenango (of New Castle) play two Saturday night games (vs. Union and vs. Western Beaver). I also saw South Side host Our Lady of Sacred Heart. And the second half of Warren JFK vs. Cleveland Rhodes. And the second half of Pittsburgh Shady Side vs. Jeannette. After that, it was teams that usually play on Friday that were hosting games on Saturday. After Week 10 concluded, I saw three games in Week 11. On Friday Night, I caught the final game of the regular season in PIAA District 10 when Greenville hosted Harbor Creek. Much more subdued crowd (and much smaller) than when playing their rival Reynolds. Greenville had two punts returns for touchdowns to win easily, 41-21 with a few garbage scores by the Harbor Creek Huskies. On Saturday afternoon, I traveled to Pittsburgh to watch the Pittsburgh City League championship between Pittsburgh Perry and Pittsburgh USO at Cupples Stadium. I’ve been to this stadium before. It’s really nice, tucked into the hillside right on Carson St on the south side of Pittsburgh. A train runs–frequently–behind the visitor stands and a large bridge and roadway curves off high above the visitor stand. Parking can be a horrible pain for seeing games here, however. USO also is known as “University Prep” by the local paper, but the Pittsburgh City League recognizes them as USO due to their co-op amongst three schools. University Prep, Science & Tech, and Obama. Because of this, the team lacks an ‘identity’. They call themselves the Wildcats, but their band is from the Obama Eagles. Despite that, they’re the defending champions in the second season and played frequent dominant team, Perry Traditional Academy. The Perry Commodores knocked out my high school back in 1997 at this very stadium in the first round of the state playoffs, 41-0. The game was scoreless until late third quarter when Perry finally scored to make it 6-0 with a missed extra point. USO finally scored in the fourth to tie it and also failed to convert. The game went to overtime where USO had the ball first. PIAA uses NFHS rules and start at the ten yard line. USO was sacked on first down for a nine-yard loss and then threw incomplete for the next three downs to end without a score. Perry then got the ball next. A one yard run was followed by two incompletes to set up fourth-and-goal at the 9. Perry lined up for the 26 yard field goal and their kicker nailed it, to win 9-6. It was only the fourth FG made in the entire season by the entire Pittsburgh City League. After that, it was driving back home to Steubenville for the Maysville first round game at Harding Stadium. I’ll try to update some out-of-state games later this week. The Wyoming state playoffs just concluded this week and the Minnesota playoffs are headed to Minneapolis this upcoming weekend. Unlike last year, I know where I’ll be next week. But, I know I’ll have a fun time next week.